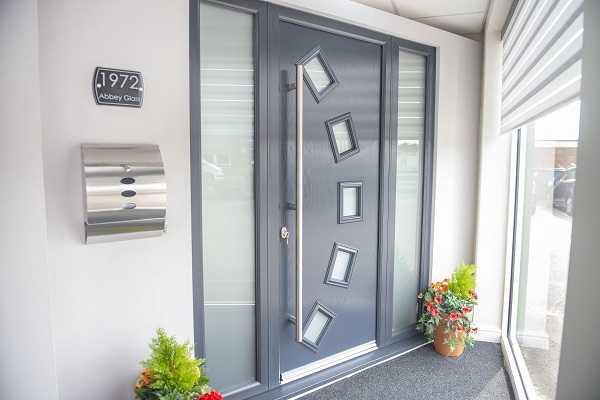 The GRP (Glass Reinforced Polyester) door skins come in a variety of colours and woodgrain finishes and are compression moulded to give an authentic timber appearance. This provides a low maintenance impact resistant door which is both UV and thermally stable. The perimeter of the door slab is strengthened with resin bonded plywood and capped with a solid PVCu edge. The doors have an insulating core of polyurethane foam and 15mm plywood which gives excellent thermal and sound insulation and increases security. Lever handles operate a high security locking system incorporating five hookbolts. We also fit anti snap/bump cylinders which enables us to achieve a Police Preferred Security Specification. A comprehensive range of woodgrain textured doors in over 40 colour options, with a choice of matching subframe, side panels, choice of glass designs and door furniture.